If ever a year summoned commentators to think outside the conventional boundaries, it was 2016. The world’s last superpower elected an impetuous, self-absorbed reality TV star to be its commander in chief. His campaign evidently was assisted — in what measure we still don’t know — by a Russia that remains a virtual dictatorship. 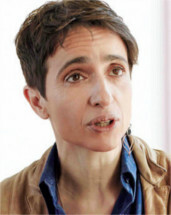 It was a year made for Masha Gessen. In essays written for The New York Review of Books, the Russian-born journalist and author brilliantly deconstructed the Trump-Putin relationship, confronted unquestioned assumptions about how power works, and described a profound crisis of democracy. Some of her dark forecasts (a stock market crash if Trump won) have not come true (yet), but there is much she got right, not least the ascent of Trump. “It’s time to force ourselves to imagine the unimaginable…Trump being elected president.” That was in July. Whether or not you shared her deep pessimism about a Trump presidency, she made you think.